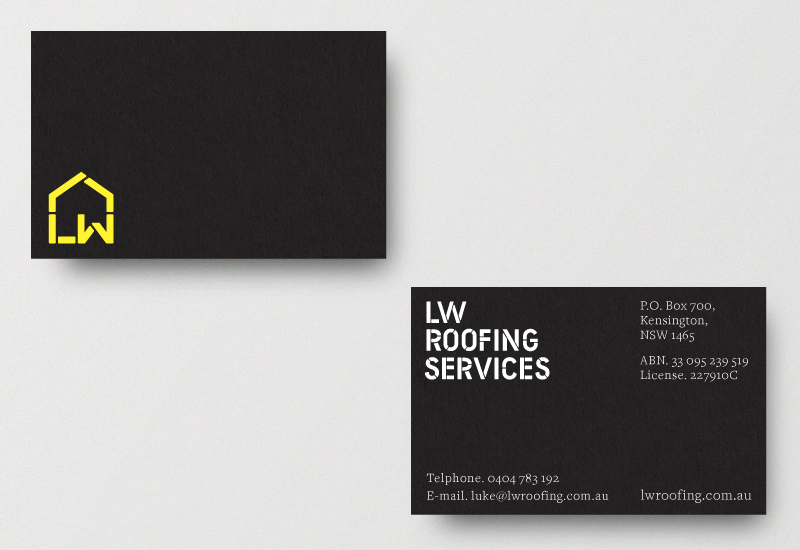 LW Roofing Services is an Australian business that specialises in roof and gutter repair and build. I was commissioned to develop a new visual identity that would be far more restrained and polished, and would convey experience, reliability and quality. The solution is a fusion of traditional craftsmanship cues, typographical detail and contemporary reduction in the form of a monogram, logotype and business cards. The monogram’s heavy, consistent, single line weight and stencil cut detail quickly establishes a solid and robust quality with the initials LW acting as the foundations of a good roof. The logotype’s uppercase characters and stencil cut detail deliver, like the monogram, a reliability and robust quality that is informed by the modual nature of roof tiles. The changing direction of the cuts across each of the characters introduces aesthetic difference and links letterforms. A combination of bright yellow foil and a dark slate grey board across the business cards draws together familiar industrial sensibilities and roofing materials without be explicit or contrived. The use of a lighter type with serif detail looks to reflect the value of good quality, introduces high aesthetic contrast and communicative breadth. The grid-based layout is influenced by the structure, processes and materials of roof construction.